One of the biggest challenges in Wedding Photography is showing the closeness between the bride and groom. Not all couples are willing to get really romantic for their wedding pictures so it can often be a challenge. We have found that the best way to do this is to not over pose the couple and give them too many specific instructions. Most newly married couples do not want to be ordered around and told constantly to hug and kiss, etc. Instead, we find it more effective to place the couple in a beautiful setting somewhere with a nice background and leave them alone for a while. We may give some very simple instructions including just asking them to interact. If we see that they are not doing much, we may be a little more specific. We will often tell them to hug and snuggle, etc. Sometimes this works and sometimes it doesn't. But either way, it makes a good starting point and usually leads to something usable. 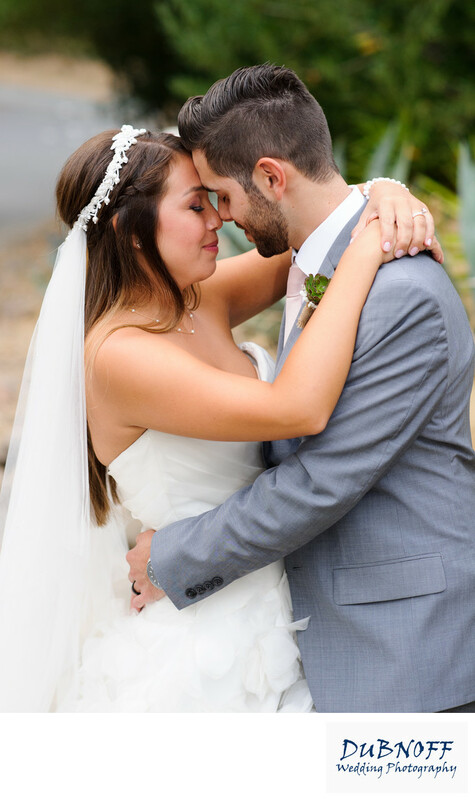 In the image above we asked the couple to go forehead to forehead and close their eyes. The bride and groom did the rest.